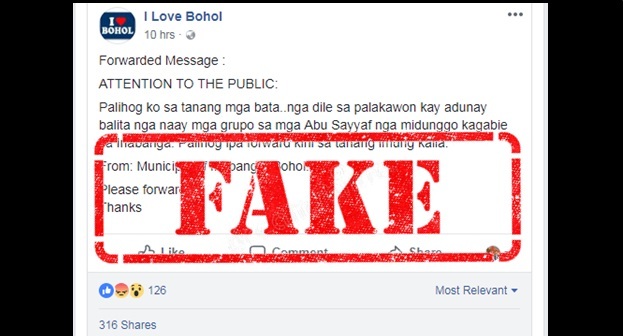 The local government unit of Inabanga has denied information spread on social media claiming that Abu Sayyaf bandits have slipped into the town. “Gama-gama lamang kana aron lang sa paghatag ug kabalaka ug kahadlok sa katawhan,” the Inabanga government said in its official Facebook page. The erroneous report warned residents not to allow children to wander as a group of Abu Sayyaf terrorists arrived in Inabanga. One of those who spread the information was a Facebook page called I Love Bohol. The post which was shared 316 times has still not been taken down as of this posting, despite the page being lambasted by netizens for sharing incorrect information. According to TaRSIER 117, Bohol’s emergency response unit, the Inabanga Municipal Disaster Risk Reduction Management Office also denied the report. “As per the DRRM Officer of the Municipality of Inabanga, there is NO Truth on the circulated messages regarding the presence of Abu Sayyaf Group in their area,” it said. However, TaRSIER 117 still called on the public to be vigilant and to immediately report suspicious personalities and activities. In April last year, 11 Abu Sayyaf bandits entered Bohol through the town of Inabanga on board small pumpboats. Vigilant residents however immediately alerted government security forces which in turn intercepted the terrorists.